Popular desktop alphabetic file in distinctive colors. Organize paperwork using this 21-pocket file as a desk or shelf organizer. Sturdy construction features reinforced liners on the front and back panels. Full-height colored gusset, clear poly tape reinforced at top. 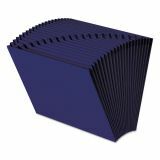 Smead Heavy-Duty A-Z Open Top Expanding Files, 21 Pockets, Letter, Navy Blue - Desktop expanding file features 21 pockets with A-Z indexing and durable, quality construction. Each pocket expands to 7/8". Full-height dividers display the alphabetic indexing on their two-ply tops. Double thick front and back panels have heavy reinforcement liner board. Expanding file also offers full-height matching color gussets with clear poly tape to reinforce the top.